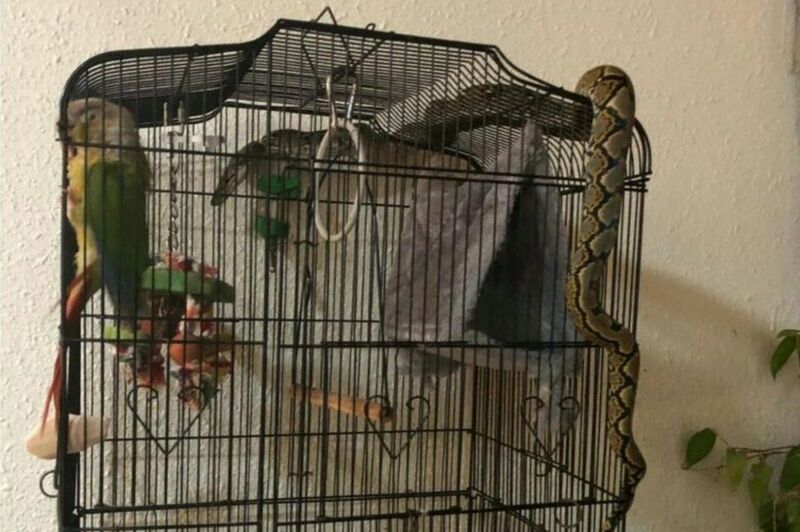 A pet cockatoo in Singapore has been rescued from the jaws of death, after its owners discovered a huge python coiled around their bird's cage. The 1.5m long (5ft) snake was found on Monday in Melvin Yap's home. Mr Yap extricated the python with a stick, and passed it to an animal rescue group. He told the BBC that their pet bird, named Nikki, survived unharmed, but was "petrified". Large snakes are not uncommon in Singapore, which has abundant wildlife. Mr Yap said he was still sleeping early on Monday morning when he was woken up by frantic screams in the house. "My domestic helper was in the process of cleaning the bird's cage. The snake was just right in front of her, and she didn't see it until my wife spotted it and screamed 'Snake! '," he said. "There was just mayhem and panic." Mr Yap rushed downstairs along with his 10-year-old daughter, who assisted him as he "coaxed" the snake into a large plastic bag with a stick. They later put it into an unused fish tank "so it wouldn't suffocate", and called a local animal rescue group which took it away later that afternoon. His encounter, which was covered by local media outlets, drew astonished responses from Singaporeans, not least for the way in which he caught the reptile. "STICK and PLASTIC BAG???? Salute ah!" wrote one incredulous Facebook commenter. But Mr Yap said he "just wanted to quickly contain the situation, and ensure my loved ones didn't get hurt". "After I caught it, I realised it was more scared of us than the other way round. It was in defensive mode, curling up and trying to protect itself." He added that his family grew less fearful of the snake once they realised it was a python, which does not have a venomous bite. Baby pythons had been previously spotted in neighbouring homes, though they were often killed, said Mr Yap, whose home is near a forested area. Singapore, a densely-built island that still has thriving pockets of primary rainforest, has seen increasing human-wildlife encounters in recent years, involving wild boars, deer, snakes, and monkeys. There have also been reports of giant pythons, which are common in South East Asia, attacking people. In March this year an Indonesian man was apparently swallowed by a python, while earlier this month another Indonesian was badly hurt after wrestling with a python - which was subsequently killed and eaten. But Mr Yap said he did not want to harm the snake which slithered into his home. "We're just stewards of the environment and the creatures who live in it. I'm just grateful and appreciative of the encounter," said the 46-year-old animal lover, though he admitted his wife "still has some concerns about lurking snakes". Meanwhile, Nikki appears to still be recovering from its near-death experience. "Usually in the morning it loves to chirp, but this morning it was extremely quiet. No noise from the poor bird," said Mr Yap. "I think we'll have to give it more sunflower seeds as a treat." Reporting by the BBC's Tessa Wong.